Brilliant blue sapphire sparkles against the white gold of this genuine sapphire solitaire women's cross necklace in 14K white gold from Apples of Gold Jewelry. The bright blue of the authentic solitare sapphire gemstone adds a frosty hue to the white gold of the polished cross pendant, which measures 1.20 inches in height and 0.65 inches in width. 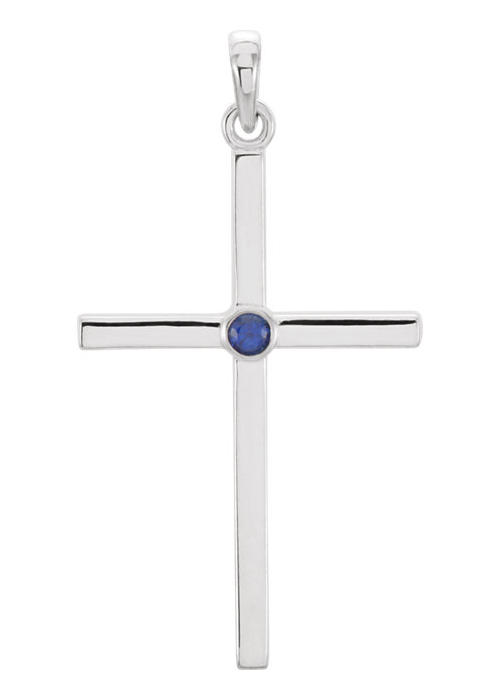 The AA rated sapphire gemstone is 2mm in size, and is bezel set into the cross pendant. The smooth look of the cross is simple, yet appealing, and looks wonderful combined with any outfit. "To every thing there is a season, and a time to every purpose under the heaven: A time to be born, and a time to die; a time to plant, and a time to pluck up that which is planted;"(Ecclesiastes 3:1). We guarantee our Blue Sapphire Solitaire Cross Necklace, 14K White Gold to be high quality, authentic jewelry, as described above.